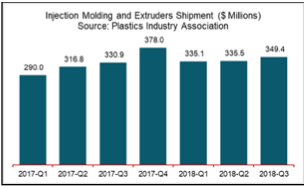 The PLASTICS Committee on Equipment Statistics (CES) collects monthly data from manufacturers of plastic injection molding, extrusion, blow molding, hot runners and auxiliary equipment. A confidential, third-party fiduciary, Vault Consulting, LLC, compiles the monthly data and analyzes individual company data for consistency and accuracy. Once this crucial process is completed, Vault aggregates and disseminates reports to participating companies. If this is something you and your company are interested in, please contact Katie Hanczaryk at [email protected] or 202-974-5296.